The Probe Committee constituted by the congress of Great Ife students to facilitate the handing over of the Union properties from the previous administration to the current one has argued variably on the terms of reference guiding its operation. OAU Peeps News Agency spoke with some members of the Probe Committees immediately after the deadlocked handing over meeting and they had different interpretations of their terms of reference as relating to their presence in the meeting. The acting Secretary of the committee, Abiodun Idis a.k.a Banjris who confirmed to us that the SU president is aware of the meeting and he called him this morning to go and attend the meeting since the committee is in charge of handing over. He said he does not why TY himself was not present in person. The Division of Student Affairs (DSA), Obafemi Awolowo University facilitated handing over event of all Union projects, properties and account by the Ibikunle-led administration to the TY-led current tenure suffered set-back as a result of the absence of the current Students’ Union executives’ absence. 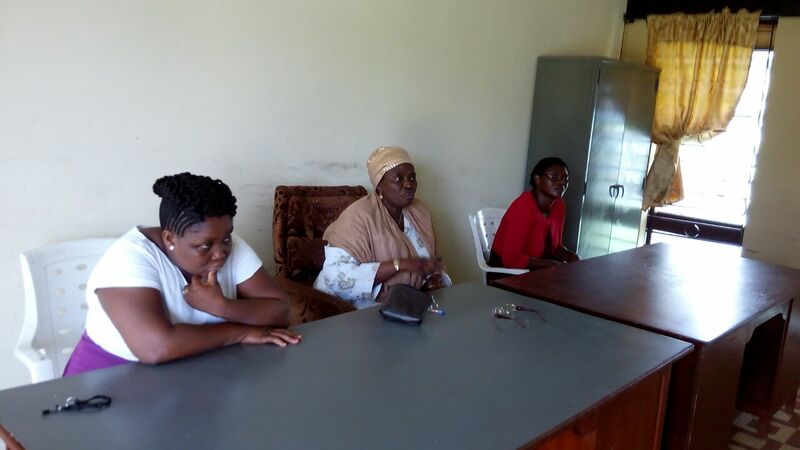 The meeting that was supposed to start 2:00pm did not begin until some few minutes to 3pm when the acting Dean, Division of Student Affairs, Dr (Mrs) L. M. Durosinmi arrived with her aides to the venue that was obviously set for the event. Dr (Mrs) L. M. Durosinmi recognized the presence of the past Students’ Union executives, Electoral Commission chairman, the Probe Committee members, SRC members, Judicial Council members and the Pressmen present. The absence of the members of the Students’ Union Central Executive Council (CEC) served as a major barrier for the proper transfer as they were not on ground to receive what the outgoing Union Officers brought. The recent Press Statement of the Association of Campus Journalists has not only addressed the attacks on their members but it has also relayed to the Great Ife community her view on the Hon. Seun versus Ibiyemi issue. We cannot put out the blazing fire of our pen’s ballpoint without putting ink to paper on invariably, currently, the most controversial debacle in the Student Union and extensively on this campus – the tussle for power, right to office; and the sudden as well as mysterious interpretations of the OAU SU Constitution. It yet remains a hot matter as to who is the rightful leader between both parties since no other activity has questioned Ibiyemi’s independence and self-declaration as the Secretary General of the Union and Hon Seun’s Congress-staked approval as the Secretary General of the same Union! 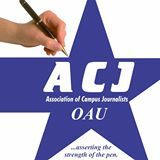 Campus Journalists in Obafemi Awolowo University under the aegis of Association of Campus Journalists (ACJ) met with the OAU Students’ Union Public Relations Officer, Ojedokun Emmanuel a.k.a Immanuel Kant over attack on media practitioners on campus. 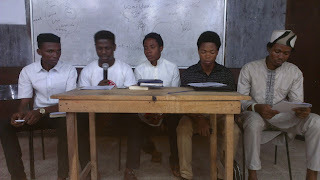 In a report centralized by the ACJ which reflects on the totality of the discussions that held during the meeting, a host of questions begging answers since the assumption of office of the Central Executive Council of the Students’ Union were presented to the Union through the PRO, Mr Ojedokun Emmanuel. 	Was it not ACJ that stood as a representative of the entire student body to monitor the activities of the then Electoral Commission as well as work with them to ensure a free and fair election as we have always been known to do? 	What crimes have campus journalists committed to provoke such treatments? OAU Peeps Congratulates the freshmen of the Obafemi Awolowo University as they officially become students of the University. The Entire Management of OAU Peeps News Agency wishes the Muslim community of the Obafemi Awolowo University, ile-ife and beyond Ramadan Kareem as they commence this holy month. The Campus Connect Initiative (CCI), Obafemi Awolowo University branch has late last week demanded that the congress-reinstated Secretary General of Great Ife Students’ Union, Oketooto Oluwaseun a.k.a Hon. Seun should vacate seat in line with the Tribunal declaration. In a press conference organized by the Initiative, the leaders argued that the Tribunal maintaining its fairness having been persuaded by evidence presented before it gave a magnanimous decision sacking the 'elected' Secretary General from acting as the Secretary General of the Union for Electoral Fraud and lack of the required 2.5 CGPA and as such, the decision should be respected. The SU President in person of Omotayo Akande a.k.a TY was also berated for not respecting a judicial order but rather resolving to use a congress to pervert the decision of the Tribunal in favour of Hon. Seun. The Pharmaceutical Association of Nigerian Students, OAU invites the entire Students Community of the Obafemi Awolowo University to her freshers party which is scheduled to hold on Saturday June 20, 2015. 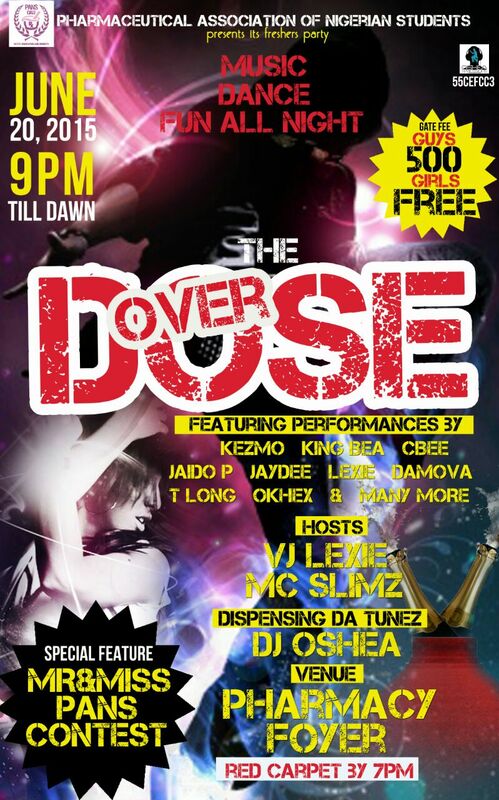 Great Ife Turn Up! It’s simply an Overdose of fun!